U.S. Trade Representative Michael Froman (right) listens about work in the New Balance factory in Norridgewock on Monday. U.S. Rep. Mike Michaud, D-Maine (left), and U.S. Sen. Angus King, I-Maine, also listen. 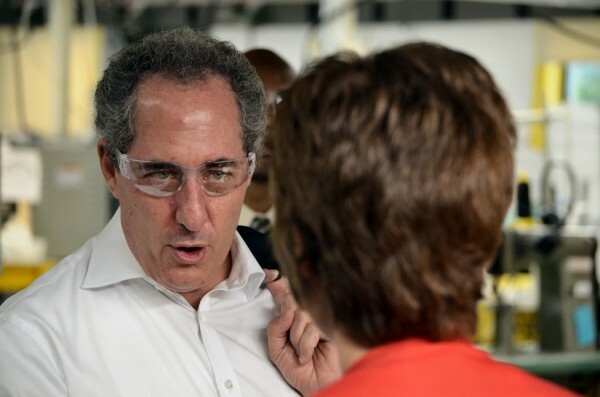 United States Trade Representative Michael Froman toured the New Balance factory in Norridgewock on Monday. 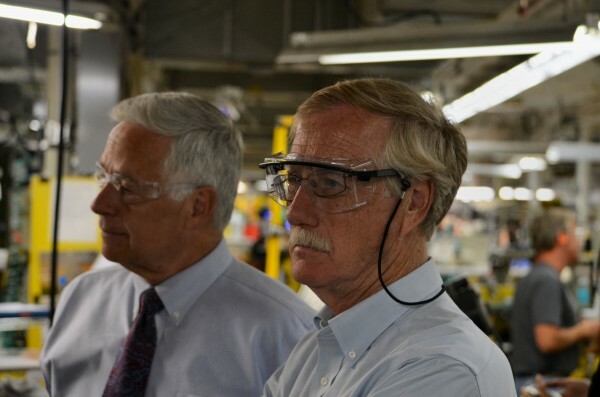 U.S. Sen. Angus King, I-Maine (right) and U.S. Rep. Mike Michaud, D-Maine, tour the New Balance factory in Norridgewock on Monday with U.S. Trade Representative Michael Froman. 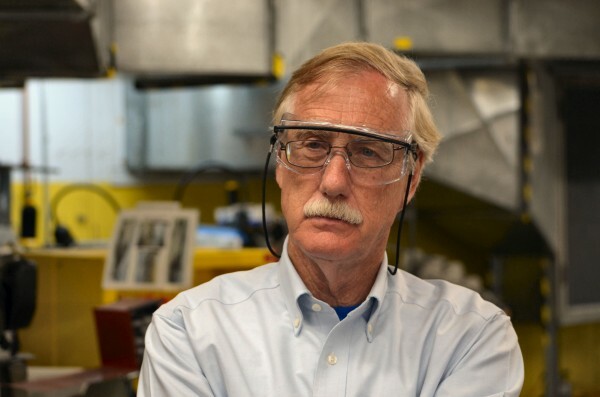 U.S. Sen. Angus King, I-Maine, looks on as employees work at the New Balance factory in Norridgewock on Monday. 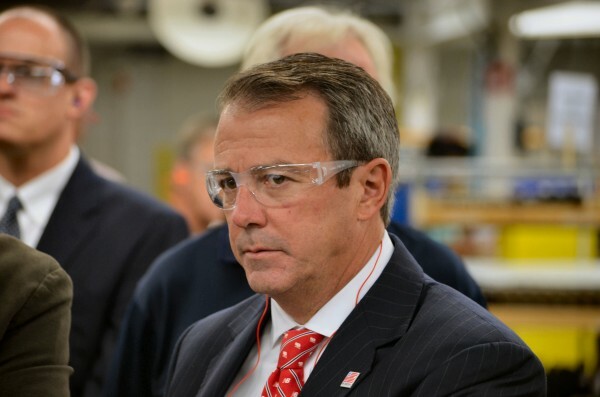 New Balance CEO Rob DeMartini looks on as U.S. Trade Representative Michael Froman tours the New Balance factory in Norridgewock on Monday. U.S. Rep. Mike Michaud, Sen. Angus King, U.S. Trade Representative Michael Froman and New Balance CEO Rob DeMartini talk about trade issues Monday at the New Balance factory in Norridgewock. NORRIDGEWOCK, Maine — U.S. Trade Representative Michael Froman stressed the importance of manufacturing jobs and strengthening the middle class as he spoke to hundreds of employees at a New Balance athletic shoe factory on Monday morning. 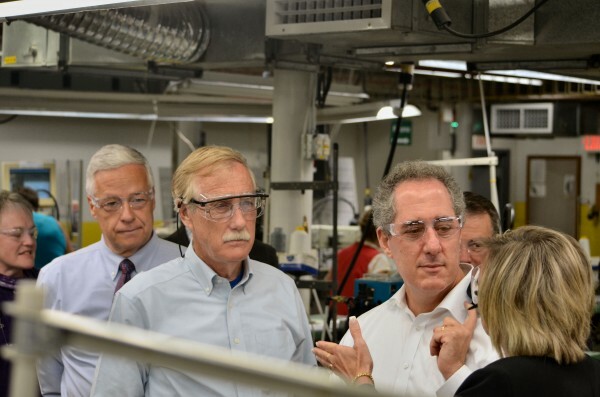 Froman toured the facility along with New Balance CEO Rob DeMartini, U.S. Rep. Mike Michaud, and U.S. Sen. Angus King. They spoke to New Balance associates about their work and why they believe it’s important to save American manufacturing jobs by keeping existing footwear tariffs in place. 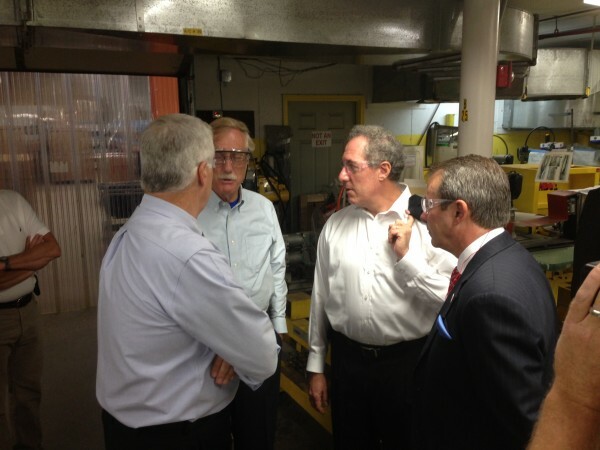 Froman toured the Norridgewock plant that has nearly 400 employees. New Balance also has facilities in Massachusetts, Michigan and Missouri. Its Maine facilities in Norway, Skowhegan and Norridgewock consist of more than 900 workers. “We’re asking the administration to do everything they can to focus on jobs in America, not jobs in Asia,” said DeMartini. Froman is the U.S. ambassador helping negotiate the Trans Pacific Partnership, a free trade agreement being negotiated among countries in North America, Asia and Australia. “I asked Ambassador Froman to come here for one simple reason, because I’m so damn proud of you and I wanted him to see that,” said King. Maine lawmakers said they want to keep the tariffs in place that allow New Balance to stay competitive with Asian athletic footwear makers. “This is actually the most important and most sensitive issue in the negotiations,” said Froman. The athletic footwear portions of the Trans Pacific Partnership negotiations will take place in late August in Brunei, he said. The partnership agreement should be signed this year, he added. Member countries of the TPP are Australia, Brunei Darussalam, Canada, Chile, Japan, Malaysia, Mexico, New Zealand, Peru, Singapore, the U.S. and Vietnam, according to the U.S. trade representative website. Malaysia and Japan are already Maine’s second and third largest export markets, the website states. Maine exports are growing twice as fast as the overall Maine economy and more than three times as fast as the U.S. economy as a whole, according to the website. More than 30,000 Mainers go to work every day because of exports, including 17 percent of all manufacturing workers in Maine. According to the website, 85 percent of Maine’s exporters, nearly 1,800 companies, are small and medium enterprises. Sue Burns, who has worked for New Balance for 14 years, is a fourth-generation shoemaker, she said. She challenged Froman to make the same commitment Ron Kirk, Froman’s predecessor, made to New Balance’s workers last September when he visited. Kirk said the Obama administration would fight to keep their jobs in the U.S.
“I just want to be the face that haunts your decisions,” Burns said, receiving laughs from the crowd. Froman didn’t directly make the pledge, but said his goal is to maximize U.S. jobs. Michaud said he agreed with President Barack Obama’s speech last week that stressed that the U.S. economy succeeds when the middle class succeeds. U.S. Sen. Susan Collins, R-Maine, was unable to make it to the factory on Monday. She prepared a statement saying she had to be on the Senate floor because of her position as Senior Republican on the Transportation and Housing Appropriations Subcommittee.